In a previous post I mentioned my annual battle with capturing the epicness of Purim. The costumes, chaos and overall rarity of the celebration soon become a mind-field. I often end up wandering the streets sporting many a camera and desperately unraveling how and when to take a picture. The usually forbidden rule of photographing Hassidic Jewish people is lifted for one day only; and this liberation provides additional pressure. I’ve been photographing Hassidic Jewish women in Stamford Hill for over 3 years now and it hasn’t got any easier, with regards to both access and ideas. For some reason with this subject I find myself more precious with my frames. Perhaps it’s because I am so terrified of offending people or seeming ignorant and voyeuristic. When I first began taking pictures I used to simply shoot anything and anyone. I hid behind my lens with little regard for the consent or objection for the world I was seeing. My approach now greatly differs and I try to collaborate with subjects at all times. In moments when I want to document without approaching I will do this by making it absolutely obviously clear that I am about to take a picture. I will wait for a few moments engaging eye contact; trying desperately to analyze whether or not they silently consent. This moment was one of those. I stood perched on a street corner and waited for a few moments whilst I watched this mother and child. What captivated me was that the costumes of Purim only really look bizarre in isolation and with the absurdity of such a normalized suburban backdrop. When amongst the busy streets lined with children dressed in costume I struggle to make sense of what I am seeing and it is beautifully bizarre but too busy to capture. This was a delicate moment and one that could have occurred without the fancy attire; but that for me, made it surreal. 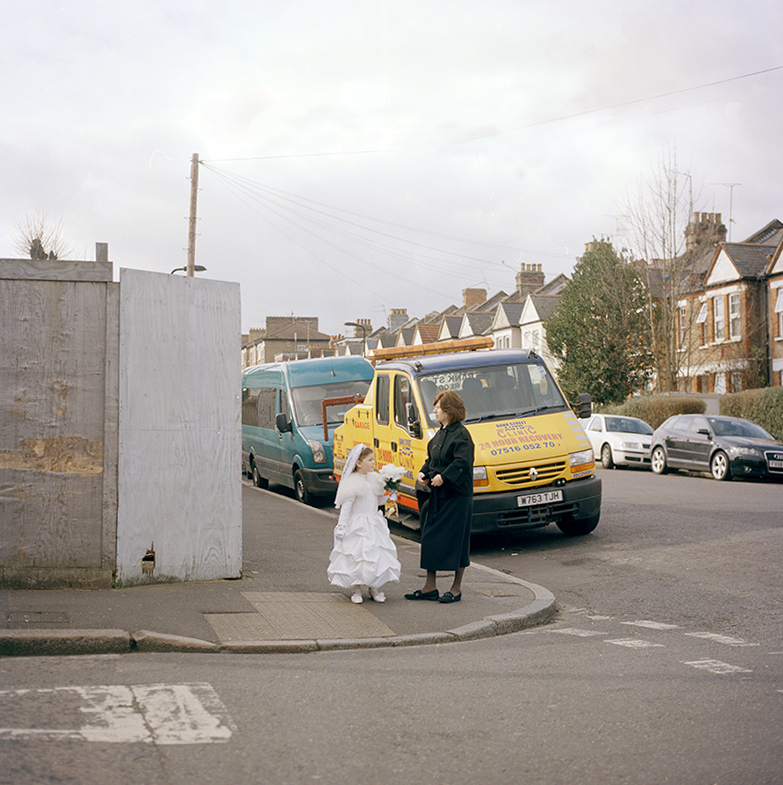 A mother waiting with to her young daughter dressed as a bride; a very simple moment. Who knows how on earth I can capture Purim, but all I know is that each year I relish the challenge and embrace the celebration.